HARLEM — The absentee landlord of two vacant lots on West 122nd Street wants to boot a 30-year-old community garden to cash in on the neighborhood's booming real estate market. "Plans are being made to enclose our client's properties with a ten-foot fence around each lot," read a letter signed by the owner's lawyer, Kerry John Katsorhis, to the gardeners. "Demand is herein made for you to vacate both lots immediately." The Joseph Daniel Wilson Memorial Garden sits on four lots on the north side of 122nd Street between Seventh and Eight avenues, with two of the lots owned by Alix Saget of Queens, and the other two owned by the city. Saget, who pays between $17,000 and $18,000 in annual taxes for the lots, wants to sell. He previously tried to trade the lots with the city for two contiguous lots in another part of town, but those negotiations went nowhere, Katsorhis told DNAinfo Wednesday. While Saget recognizes the community garden is there, he is in his 80s and lives off Social Security, so the lots have become a financial burden, the attorney said. 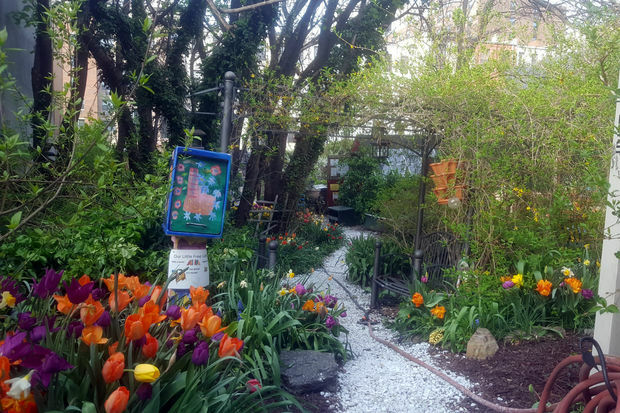 Katsorhis, who plans to ask a Manhattan Supreme Court judge to remove the gardeners from the lots before fencing them off, is willing to sell them to the city and preserve the garden. But the lots are worth much more than the $300,000 Manhattan Borough President Gale Brewer has set aside to buy them, he said. Because Saget's lots are not next to each other, fencing them off wouldn't simply make the garden smaller — it could destroy it, explained Haja Worley, who along with his wife Cindy helped plant the original garden in the mid-1980s, when half the houses on the block were abandoned. What is particularly frustrating about the situation is that the owner now stands to gain hundreds of thousands — if not millions — of dollars while the people who built the garden could end up with nothing, said Elizabeth Gonzalez, the president of the local block association. The garden hosts dozens of community events and partners with a local school on an educational program, as well as boasting a beehive, an active CSA and an active feral cat colony to keep rodents at bay. The gardeners are hoping the city will buy the lots from Saget and preserve the space, after Brewer Brewer allocated $300,000 in capital funds to pay for the lots in June. To supplement that cash, the gardeners are trying to raise $1.5 million through bake sales and an online fundraising campaign. They've raised just $1,024 in eight days. This isn’t the first time the garden has been threatened with a land grab. The city sold two larger vacant lots that were part of the original green space for about $400,000 each in 2003, essentially slicing the garden in half, records show. But despite the threat of fences shutting the garden down, she remains confident. Unlike the 2003 sale, this time the garden has some support from the city. “Then, the city just took what they wanted whereas now we have a good number of city officials behind us,” she said.